Whole life costs extend beyond initial installed costs and include the operation and maintenance of a pipeline over the design life of the system. A long service life can lead to reduced in-service and replacement costs. One of the most common forms of maintenance carried out on pipelines is high pressure water jetting; a process used to ensure that pipes run free of blockages and to remove accumulated material that would otherwise compromise the hydraulic performance of the system. The maximum jetting pressure specified within the Sewer Jetting Code of Practice is 4,000 psi (276 bar) for concrete pipes whereas the maximum for plastic pipes is generally 2,600 psi (180 bar) within the same code and no more than 1745 psi (120 bar) according to European standards. 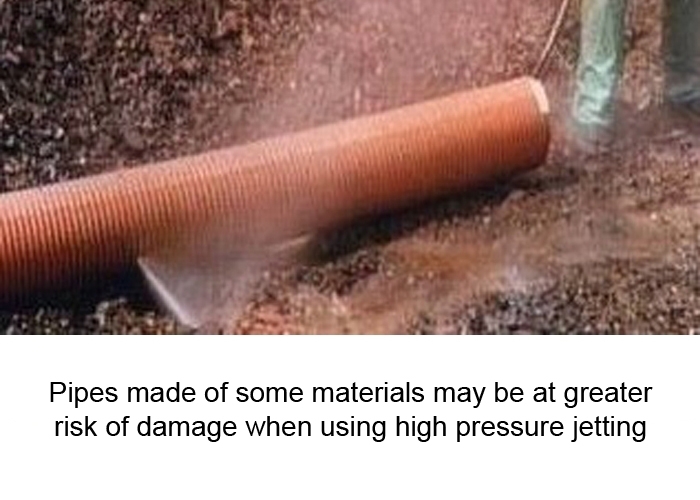 By following the Sewer Jetting Code of Practice all pipelines can be properly maintained without causing damage to the pipe, although many water companies accept a higher jetting pressure for concrete pipes compared with plastic pipes as it is well known that concrete pipes are more resistant to damage. Concrete pipes have a proven service life of over 100 years and are unique in gaining strength as they get older. Modern concretes, with the incorporation of pulverised fly ash or ground granulated blast-furnace slag confer enhanced properties which can make concrete even more durable. All other pipeline materials will get weaker with age and flexible pipes may deform more and more as they get older, making them more likely to suffer age related structural defects. There is already sufficient proof of a concrete pipe service life of at least 170 yrs. In the United States, sections of a 6 inch concrete sewerage pipe first installed in 1840-1842 were exhumed, tested in 1982 and were found to be in a good condition. Parts of that pipeline in Mohawke, NY are still in operation to date. For all water companies in the UK, the estimated time to replace the sewerage network at the average rate of capital expenditure under the asset management programme (AMP) would take some 800-2000 years. In this context, a design life of 50-100 years is somewhat meaningless and a significantly longer life expectancy is required if there is any chance of the sewer network remaining intact before funds are available for remediation or replacement.